5. Which one gives the most valid and recent explanation for stomatal movement? 6. Which of the following criteria does not pertain to facilitated transport? 9. Given below is the diagram ofa stomatal apparatus. In which of the following all the four parts labelled as A, B, C and D are correctly identified? 24. When a cell is fully turgid, which of the following will be zero? 35. Which of the following is used to determine the rate of transpiration in plants? 41. Minerals absorbed by root move to the leaf through . Root pressure is positive pressure that develops in the xylem sap of the root of some plants. It is a manifestation of active water absorption. Cohesion, adhesion and surface tension are the forces responsible for movement of water up the tracheary elements. Water molecules remain attached to one another by a strong mutual force of attraction called cohesion force. On account of cohesion force, the water column can bear a tension or pull of upto 100 atm. Therefore, the cohesion force is also called tensile strength. Its theoretical value is about 15000 atm but the measured value inside the tracheary elements ranges between 45 atm to 207 atm. Water column does not iurther break its connection from the tracheary elements because of another force caded adhesion force between their walls and water molecules. Another force called surface tension accounts for high capillarity through tracheids and vessels. In girdling or ringing experiments, a ring of bark is cut from the stem. It also removes phloem. Nutrients collect above the ring, where the bark also swells up and may give rise to adventitious roots. Growth is also vigorous above the ring. The tissues below the ring not only show stoppage of growth but also begin to shrivel. Roots can be starved and killed, if the ring is not healed after some time. Killing of roots shall kill the whole plant, clearly showing that bark or phloem is involved in the movement of organic solutes towards root. The transpiration process, pulls water upwards with the help of cohesion and adhesion properties of water molecules. According to transpiration pull theory, due to transpiration, the water column inside the plant comes under tension. This is called ‘transpiration puli’. On account of this tension, the water column is pulled up passively from below to top of the plant (almost like a rope). Root pressure is the pressure that forces water, absorbed from the soil, to move through the roots and up (i.e., pushes it up) the stem of a plant. It maybe due to both the osmosis of water from the soil into the root cells, and the active pumping of salts into xylem tissue which maintains a concentration gradient along which the water moves. 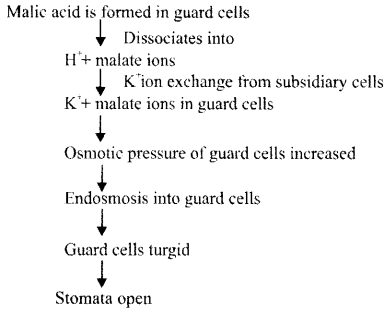 According to this theory, K+ ion enter and accumulate in guard cells during daytime, causing opening of stomata and during night, K+ ions move out of stomata and stomata closes. Facilitated transport or facilitated division is the spontaneous passage of molecules or ions across a biological membrane passing through specific transmembrane integral proteins. Facilitated diffusion is mediated by protein channels and carrier proteins. Most transport proteins that mediate facilitated diffusion are very selective and only transport certain molecules. The major classes of proteins involved in facilitated diffusion are aquaporins, ion channels, and carrier proteins. Importantly, neither channels nor carrier proteins require energy to facilitate the transport of molecules; they enable molecules to move down their concentration gradients (downhill transport). The guard cells are bean-shaped in surface view, while the epidermal cells are irregular in shape. The guard cells contain chloroplasts, so they can manufacture food by photosynthesis (The epidermal cells do not contain chloroplasts). Guard cells are the only epidermal cells that can make sugar. Various ions from the soil are actively transported into the vascular tissues of roots, water follows its potential gradient and increase the pressure inside the xylem. This positive pressure is called root pressure. Effect of root pressure is observable at night and early morning when evaporation is low and excess water collects in the form of droplets near the tip of leaves of many herbaceous plants. Such water loss in its liquid phase is known as guttation. Stomata are the main organs for transpiration. The stem and leaf epidermis are provided with numerous stomata. Diffusion of water vapour through the stomatal pores is known as stomatal transpiration. Transpiration occurs while the stomata are open for the passage of carbon dioxide and oxygen during photosynthesis. Stomatal opening and closing is regulated by the movement of guard cells. Water molecules remain attached to one another by a strong mutual force of attraction called cohesion force. On account of this force, the water column can bear a tension or pull of upto 100 atm. Water column does not further break its connection from the tracheary elements (vessels and tracheids) because of another force called adhesion force between their walls and water molecules. Water molecules are attracted to one another more than the water molecules in the gaseous state. It produces surface tension that accounts for high capillarity through tracheids and vessels. Diffusion pressure deficit is the reduction in the diffusion pressure of water in a system over its pure state. It is given by DPD = O.P – W.P (T.P). DPD determines the direction of net movement of water. It is always from an area or cell of lower DPD to the area or cell of higher DPD. So, cell A having lower DPD, water will move from cell A to B.
P-proteins (Phloem proteins) are components found in large amounts in phloem sieve tubes. The main function of these bodies is to seal off the sieve tube element or sieve cell by bringing about the blockage of sieve plate. These bodies perform this function when the sieve element is injured. These bodies and callose i together block the pores of sieve tube elements. P-Protein bodies and callose form blocking plugs. These bodies i remain along the walls of sieve tube elements. P-Protein bodies are assigned some in the translocation of food material in the sieve tubes but is not universally accepted. Potometer is an instrument or apparatus with the help of which, rate of transpiration can be measured. Main types of potometers are as under: Simple potometer, Farmer’s potometer and Ganong’s potometer. The whole instrument is made of glass and is consisted of a long tube, having a side tube, bent at right angles. A fresh plant shoot is cut under water and is inserted into the side tube through a cork, fitted into the mouth of this tube. The whole apparatus is filled with water and the joints are made air tight. The apparatus is placed in the sunlight. Air bubble enters the tube and after this lower end of the tube is placed in the beaker, containing water. Water is absorbed by the shoot and is transpired through the leaves. Transpiration pull is created and the air bubble begins to move alongwith the transpiration pull. Readings are taken for the air bubble and thus amount of water absorbed and transpired is calculated. The mechanism of opening and closing of stomata is explained by Active K+ ion transport theory. During night or dark : CO2 conc. increases in sub-stomatal cavities → ABA participation → K+ ions exchange stopped —> K+ ions transported back into subsidiary cells → Decreased pH → Starch synthesized in guard cells—> Decreased OP. 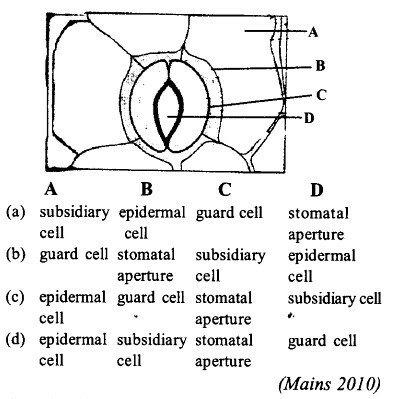 of guard cells → Exosmosis from guard cell → Stomata close. Lenticels generally appear under stomata. The lenticel of phellogen itself also has intercellular spaces. Because of this relatively open arangement of cells, the lenticels are regarded as structures permitting the entry of air through the periderm. Lenticels are characterstics of woody stem but they are also found in roots of trees and other perennials for entry of oxygen through them. Rate of salt absorption increases when temperature increases but to a certain limit as salt absorption is inhibited at higher temperature because certain enzymes are not active at higher temperature and carriers are not synthesised. These carriers are required for active transport of salts from outer space in inner space. Rate of diffusion of ions and molecules increases at enhanced temperature due to their increased kinetic activity. Thus passive salt absorption will increase. Zelitch (1963) suggested that glycolic acid is formed in the guard cells. This acid is formed under low concentration of CO2. Glycolate formed gives rise to carbohydrates. Under this condition, osmotically active material is produced and ATP synthesis also takes place. ATP is produced during glyoxylate- glycolate shuttle. This ATP helps in the active pumping of water in the guard cells and stomata open. Stomata close when this process is reversed. When the phloem cells, just near the source, for example green leaves attain higher concentration of sugars, it is called the process of phloem loading. Sucrose is photosynthesised in the chloroplasts of mesophyll cells of leaves. Mesophyll cells are connected with each other through plasmodesmata. Similarly plasmodesmata are also present between the mesophyll cells and companion cells and also between mesophyll cells and sieve tubes. There plasmodesmata are the “channels” meant for the passage of sucrose. Active transport involves movement of materials across the membrane against the concentration gradient of the solute particles. It requires energy in the form of ATP and carrier molecules. Water occurs in the soil in the different forms as: Free water, gravitational water, hygroscopic water, chemically combined water and capillary water. Free water is that water which runs away and is not held by the soil. Obviously it is not available to the plants. Gravitational water goes down into the deeper strata of earth and it is also, not available to the plants. Hygroscopic water is present in the form of thin films around the soil particles and it is also not available to the plants under normal condition but it may be available under adverse conditions. Chemically combined water is not available to the plants at all. The only water which is available to the plants capillary water. Capillary water makes up about 75% of the total water available to plants. The rest of soil water (hygroscopic, combined, free, gravitational and 25% capillary water) are not available to plants. These are called echard or unavailable water. Water potential or chemical potential in pure water is zero bar, arbitrarily. Osmotic potential or solute potential represents the effect of dissolved solutes on water potential solutes reduce the free energy of water by diluting the water. The osmotic potential of pure water is zero. If solutes are added to water its potential becomes less than that of pure waters is expressed as a negative value. In a full turgid cell, DPD = O because it has T.R = O.R It means that the cell has no further capacity to absorb any water. Water potential is equal but opposite in sign to D.P.D. So in a fully turgid cell the water potential is zero. When a cell is placed in a hypotonic solution then endosmosis occurs it means water enters in the cell and makes the cell turgid. This entry of water in the cell develops in a cell turgor pressure, which exerts pressure on the cell membrane or on the cell wall. If the cell wall is absent as is the case in animal cells then the cells burst due to turgor pressure. But in case of plant cells, wall is present to counteract the turgor pressure. This prevents the plant cells from busting in a hypotonic solution. The movement of organic food or solute in soluble form from one organ to another organ is called translocation of solutes, e.g., from leaves to stem and roots for consumption. The movement of organic material is bidirectional. Because xylem is responsible for upward movement of water and minerals, so it cannot account for downdard translocation of solute at the same time. Cortex and pith are not structurally suitable for this purpose. Thus only phloem is left where there is end to end arrangement of sieve tubes united by sieve pores which is responsible for translocation of solutes in both direction. Water is absorbed from soil by root system and mainly by root tips. There are two independent mechanisms of water absorption in plants active water absorption and passive water absorption. In active water aboiption water is absorbed by the activity of the root itself. In passive water absorption transpiration pull is responsible for absorption of water. According to this theory loss of water from mesophyll cells of leaves in transpiration decreases their T.P. and hence increases their D.P.D. or S.P. As a result of their increased DPD, they absorb water from adjacent xylem vessels of leaves. This xylem of the leaves is in continuation with xylem of stem and roots and hence this pull is transmitted downwards. The pull or tension is removed only when water is absorbed through root hair and this is passive water absorption. Thus transpiration pull is responsible for passive water absorption. Movement of water always occurs from low DPD to high DPD. During water absorption by roots, water as well as solutes enter through root hair. After absorption of water by root hair, its T.P. is increased and thus D.P.D. or S.P. is decreased. Then water from root hair moves to the cells of the cortex along the concentration gradient and finally reaches the xylem. Translocation of carbohydrates nutrients usually occurs in the form of sucrose through sieve tube of phloem. Starch is converted to soluble sucrose form. In guard cells when sugar is converted into starch, the stomatal pore closed completely. At night time, the CO2 released during respiration accumulates. As a result, the acidity of the guard cells increases and pH decreases. The decreased pH favours conversion of sugar to starch. Pressure of the guard cells falls and hence they become flaccid. As a result, stomatal aperature closes. At constant temperature, the rate of transpiration will be higher at 1.5 km above the sea level. At lower atmospheric pressure there is increase in the rate of evaporation. There is evidence to believe that besides organic acids the turgidity of guard cells is usually controlled by K+, Cl– and H+. 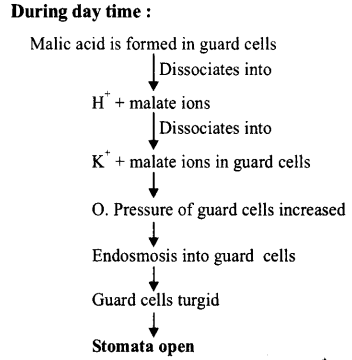 The opening of stomata is initiated by exertion of H+ by guard cells, intake if K+ and Cl–, disappearance of starch and appearance of organic acids like malic acid. In terrestrial habitats, temperature and rainfall conditions are influenced by transpiration. The rate of transpiration is directly proportional to the saturation deficit of atmosphere. Plants growing in region where transpiration is meagre do not show over heating. So transpiration prevents overheating. The loss of water through water stomata (hydathodes) is called as guttation. Guttation occurs when transpiration rate is very low as compared to rate of water absorption, due to this, root pressure is developed and water is pushed out through specialized pores at vein endings called hydathodes. Therefore guttation is not due to the activity of hydathodes but due to root pressure. Potometer is an instrument used to determine the rate of transpiration. There are four types of potometers. Simple, Ganong’s, Bose’s and Farmer’s potometer. With the help of potometers we actually measure suction of water due to transpiration. Porometer is an apparatus for knowing the relative size of stomata. Tensiometer is an instrument that measures soil water tension. Auxanometer is an apparatus used for measuring increased or rate of growth in plants. Water movement between cells is due to DPD. If a cell is placed in pure water it shows endosmosis and as a result water enters into the cell. Thus, the osmotic entry of water is due to high osmotic pressure of the cell sap. The inward movement of water is, therefore due to the fact that it’s OP > TP. The net force with which water is drawn into a cell is equal to the difference of OP and TP, known as diffusion pressure deficit. DPD = OP – TP. Transpiration pull cohesion theory for ascent of sap in trees is most widely accepted. This concept was proposed by Dixon and Jolly, 1884. It is based up on three basic assumptions which are cohesion in between water molecules, continuity of water column and transpiration pull. around them. This water is held by the capillary forces around and between the particles and is of greatest importance to plant life. mainly by roots and is moved upward to all the parts of plants via stem. It occurs mainly through xylem. A bottle filled with previously moistened mustard seeds and water was screw capped tightly and kept in a comer. It blews up suddenly after about half an hour due to phenomenon of imbibition. The absorption of water by the solid particles of an adsorbent causing it to enormously increase in volume without forming a solution is called imbibition. Minerals absorbed by roots move to the leaf through xylem. Xylem plays an important role in conduction of water. Hence, when water moves upward through xylem, minerals are also absorbed by the roots and move towards leaves through xylem only. This is known as ascent of sap. The pressure that develops in a cell due to osmotic diffusion of water inside it, is called turgor pressure. Stomata open and close due to turgor pressure of guard cells. When turgid, they swell and bend outward. As a result, the stomatal aperature opens. When they are flaccid, the tension from the wall is released and the stomatal aperture closes. Phenyl mercuric acetate (PMA) results in reduced transpiration. PMA is an antitranspirant. These are some chemicals whose limited application on the leaf surface reduces or checks transpiration. A good antitranspirant increases leaf resistance but does not affect the mesophyll resistance. Transpiration is least in high atmospheric humidity. The rate of transpiration is directly proportional to the saturation deficit. In other words, transpiration rate depends upon the gradient of vapour pressure. Hence, at high atmospheric humidity transpiration rate is low. Water potential is the difference in the free energy or chemical potential per unit molal volume of water in a system and that of pure water at the same temperature and pressure. Water potential is represented by Greek letter Ψ (psi) or Ψw. Water potential is the sum total of Ψs and Ψp.